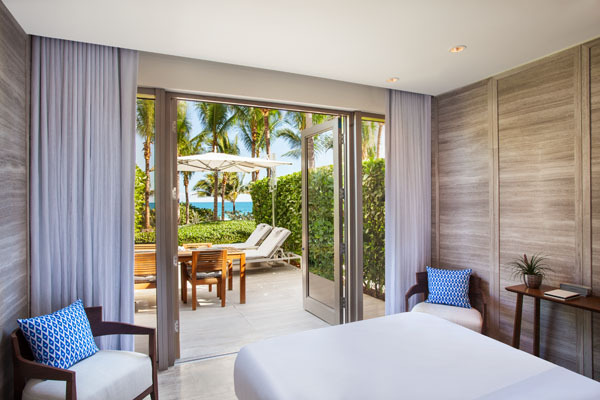 At the St. Regis Bal Harbour Resort luxury knows no bounds. As one of Miami Beach’s most prestigious hotels this is a haven of oceanfront elegance, refined luxury, and extraordinary service. Awarded the coveted Forbes five-star and AAA five-diamond awards for 2017, the St Regis also sits directly across from the renowned Bal Harbour Shops to get your world class retail therapy on. Located in the upscale residential neighborhoods of Surfside and Bal Harbour, this elegant sanctuary is close enough to the action of South Beach but retains the solitude and refinement of a posh vacation residence. 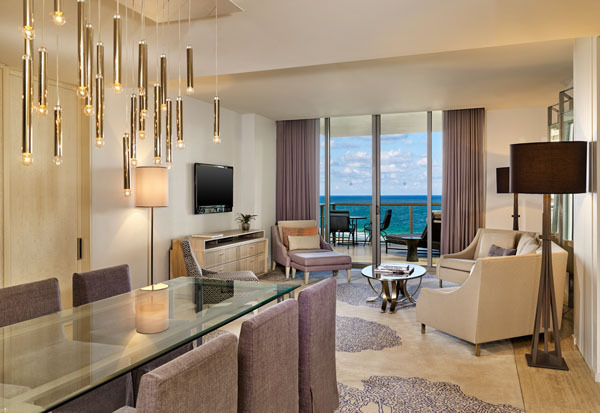 Each of the luxuriously appointed rooms and suites feature spacious living areas adorned with ensuite balconies facing the ocean that lets you truly get the South Florida experience with the gentle breeze of the Atlantic. Rooms are awash in a soothing palette that reflects the colors of the sand and ocean. Live like a true VIP in their generously sized 1,457 square foot Atlantic oceanfront suites designed by Yabu Pushelberg. This luxurious apartment style suite features a private butler, mini kitchenette, 2 balconies with unobstructed ocean views, a media room with a queen sized sleeper couch, dining area, living room, 2 full sized bathrooms along with a soaker tub, a long mirrored dressing area and ample closets, and a sumptuous King sized bed outfitted with Frette linens. 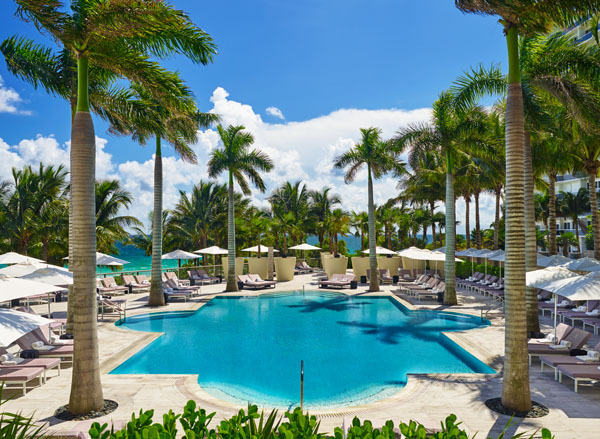 Soak in the warm South Florida sun beach or poolside, and guests can choose from the family oriented pool or the adults only tranquility pool. After a full day of sun relax and rejuvenate your body and spirit at the Remede Spa. The spa includes: steam, sauna, Jacuzzi, a couple’s room, vichy shower room, and a deluxe body treatment room. One of the Remede Spa’s signature experience includes the Bal Harbour 24-Karat Designer Facial. This treatment begins with a copper-enriched peel and ends with a bejeweled sprinkling of luxury gold oil. While we thought that was the end, they also provide the Bal Harbour Body Wrap, which uses moor mud and nourishing sea salt to attain softer skin. Experience a culinary art form like no other at the many restaurants that the St. Regis Bal Harbour provides from seafood centric Greek cuisine at Atlantikos to breakfast and tea time at the authentic French La Gourmandise. Brunch just got better with their newly launched Rose Sunday brunch making this the Sunday afternoon destination in Miami Beach. Enjoy a decadent afternoon of bottomless rose champagnes and wines as well as bloody marys and mimosas paired with gastronomic delights such as king crab, oysters, caviar, prime rib and a selection of other breakfast favorites and a striking macaron display and selection of sinful desserts. Whether looking for a glamorous getaway or an elegant yet relaxing vacation, the St Regis Bal Harbour Resort will exceed your expectations.